One is never lost...but has merely arrived at a destination which one is not aware of. Take the opportunity to explore and discover. My friend JA showed me some lovely neck warmers online. Call me a moutain tortoise when it comes to winter fashion but I haven't really thought of using anything else apart from a regular scarf to keep my neck warm. JA has opened my eyes to many fashionable possibilities! And I do like the idea of a wearable neck warmer instead of having to twirl the long scarf round and round my neck which could get a little uncomfortable sometimes and not to mention irritating too when the hanging ends end up in all the wrong places like in my hot soup or worse - between the elevator doors! So today, having a little time to spare, I set out to make myself a new neck warmer - using my old $2 fleece scarf. Nothing elaborate I told myself....I want something that's easy and fast to make and pretty too! This tutorial is gonna be so easy and quick I promise. Step 1 - Fold the scarf lengthwise in 2 (right side facing) and pin the 2 edges together. Step 2 - Machine stitch the 2 edges and remove pins. Step 3 - Stick your hand into the scarf from the opening (where the frillies are). 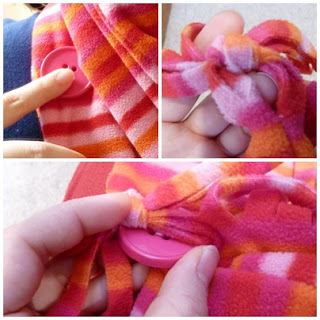 Step 4 - Flip the scarf to the right side. 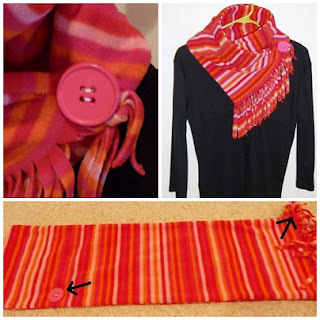 Step 5 - Wrap the sewn scarf around your neck and determine where to place the button and then sew the button in place. Step 6 - Where the scarf end is supposed to meet at the button, make a knot using the frillies and remember to leave enough space for the button to get through. Step 7 - Wear and flaunt your new neck warmer that you've completed in less than 10 minutes! Absolutely love it. I am a 'scarf wearing' lady. I have seen these neck warmers at the craft markets. 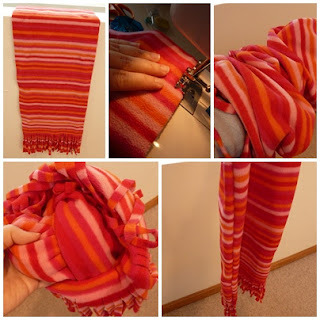 Such a great idea instead of twisting a long scarf and at times getting choked. I like how you turn a simple scarf into an elegant neck warmer. @charmaine - hey you can make one for yourself too. this one is really easy. if you don't use a sewing machine...can just handstitch! An optimistic and idealistic dreamer who has a quirky attitude towards life. Enjoys slaving over the cooker/oven and is seldom seen without a camera in her bag or Crocs on her feet. Travelling is her life and she hopes to travel around the world at least once in her lifetime. A child at heart, she absolutely adores Satchel & Bucky in the comic strip - Get Fuzzy!